Learning about teaching methods for autistic children can help you connect with your child. Gaining an understanding of how a person with autism views the world will help you figure out the best way to teach your child. Here's what you need to know about autism teaching methods. A person with autism generally has language, communications, social, and cognitive skills problems. Due to these difficulties, children with autism learn better with visual aids, imitation and structured environments that accommodate their sensory sensitivities and routines. The visual aids combined with demonstrations of different activities can help a child improve language skills. Interaction with other children can be encouraged through games, which allow some autistic children to accept a social interaction. A structured environment can make the child feel secure and more open to learning. The structure also prevents anxiety from exposure to any sensory triggers or confusion. Autism experts have developed a number of educational therapy and teaching methods that consider the unique needs of autistic children. Applied Behavior Analysis (ABA): The ABA teacher observes the behavior of a person with autism and then provides instructions on any necessary missing skills. The teachers teach by providing a concise instruction and reward a correct response. The reward system encourages the positive behavior. TEACCH: TEACCH is a structured teaching method that provides an organized school environment with a strict schedule, visual teaching methods and short, clear instructions. TEACCH programs can easily be personalized. Sensory Integration Therapy: Therapists use sensory integration therapy to help children with autism who have repetitive behavior or sensory issues. The therapy can help some children develop language skills, especially with tomatis vocal exercises. Developmental, Individual Difference Floortime (DIR): Greenspan's DIR Floortime uses play to teach autistic children emotional engagement, how to connect ideas and focus attention as well as problem solving and self-expression. Inclusion: Inclusion aka mainstreaming or integration is an approach for teaching autistic children in mainstream classes with children without disabilities. Some children have responded better to inclusive teaching than special education classes. However, some parents feel that the classes are too large and that their child does not receive enough necessary individual attention. Facilitated Communication: Facilitated communication refers to a teaching method where the teacher (facilitator) holds the autistic child's hand or arm, which encourages the child to make an effort to push the appropriate key on a portable computer as a means of communication. Detractors argue that it is difficult to determine if the child or teacher is communicating. 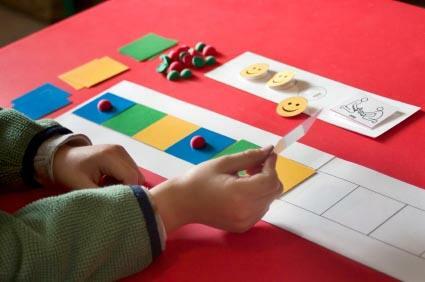 However, the teaching method seems to have improved communication for some children with autism. Picture Exchange Communication System: Picture Exchange Communication System uses visual aids for communication. Students and teachers exchange pictures to communicate ideas and activities. Sign language: Some school systems teach sign language to children with autism who have not developed speech skills. Sign language works well for many children with autism because they respond more to hand motions than a person's face. Daily life therapy: Daily life therapy, a Japanese teaching method, adds a large amount of physical exercise to typical autism behavioral therapy routines. Students at both the Higashi School in Tokyo, Japan and the USA Higashi in Boston, Massachusetts have responded well to the teaching method. American public schools are required by law to provide all children with disabilities with an individualized education plan (IEP). Even home schooled children are eligible for IEP plans. Contact your local school district for more information on how to apply for an IEP. You can find the right teaching method for your child. Research autism teaching methods and ask your child's doctor and therapist for advice. Consider your child's needs and figure out which teaching method best suit her needs. Pay attention to how your child responds to each method. It may take a few different teaching methods to find the one that works for your child. Don't be discouraged. With all the options available, you can find an educational plan that makes a difference for your child.